My conservative estimates on the amount of food served at Saturday nights Barn Dance is 5,000 pork chops and 2,000 chickens. The midwest is a prime pork producer and local caterers have refined the grilling of pork chops down to a science. I snuck behind the tent searching for the "chop grillers", who had cooked everything fresh that evening. Here's the crew from 5 B's Catering. They deserve a free plug, although the barbecue pit boss is blocking their phone number, I'm sure they're located in northern Illinois or southern Wisconsin. The large grills are being cleaned out, the coals shoveled into large metal cans. 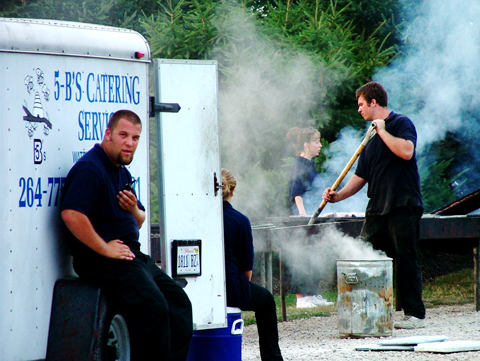 It was an oppressively hot evening and this crew stood over the grills and cooked 7,000 pieces of meat.